For other people named Charlie Jackson, see Charles Jackson (disambiguation). Charlie Jackson (born November 4, 1976) is an American football coach, scout, executive administrator, and former military service member. He joined the NCAA Headquarters staff in 2013 as a member of the College Football Rules Enforcement Group. He leads and is directly responsible for the football rules development efforts in the Southeastern Conference (SEC). His background includes multiple defensive coaching roles with the Green Bay Packers and Denver Broncos as well as coaching fellowships with the Atlanta Falcons and St. Louis Rams. He also served as a college scout for the Seattle Seahawks organization. He has collegiate experience at Colorado, UCLA, Utah State, Buffalo, and the United States Air Force Academy. Jackson as a member of the Green Bay Packers defensive coaching staff. Born in Vienna, Georgia, Jackson is a 1995 academic honors graduate of Macon County High School in Montezuma, Georgia. As a football player at Macon County, he was named to the Georgia Academic All-State football team and many on the field accolades, including First Team All-State recognition and Georgia Class-A Football Defensive Player of the Year honors. He was named First Team All-Area by the Americus-Times Recorder, First Team All-Middle Georgia by the Macon Telegraph & News, and First Team All-State by the Atlanta Journal-Constitution and the Georgia Sports Writers Association. Jackson earned a bachelor's degree in management from the United States Air Force Academy. He has a master's degree in management and sports studies from California State University, Long Beach. Jackson accepted an appointment to the United States Air Force Academy, and he participated in football and indoor track and field as a student-athlete. One of his many football highlights was his sophomore season performance against the United States Naval Academy in 1997. In front of the largest crowd in Navy-Marine Corp Memorial Stadium history, undefeated and #16 ranked Air Force traveled to Annapolis and defeated Navy 10-7. Jackson was named player of the game and subsequently conference player of the week. Following his senior football season, Jackson was selected by his teammates as a permanent team captain and recipient of Air Force football’s highest honor, the Brian Bullard Award, as the player who displays unselfishness, pride in his role, total team commitment, and 110 percent effort. Jackson helped Air Force become a consistent member of the Top 25 national rankings, including a Top 10 final ranking and conference championship in 1998. Jackson was a Commissioned Officer in the United States Air Force and ascended to the rank of Captain while being stationed more than four years at Tyndall Air Force Base, Florida and Los Angeles Air Force Base, California. His duties included serving as the U.S. Government point man in negotiations with three foreign government agencies in support of international treaty agreements. 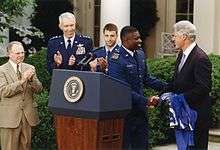 Charlie Jackson giving a White House Rose Garden presentation to United States President, Bill Clinton, on May 9, 2000. Charlie Jackson seen with President Clinton, College Football Hall of Fame Coach, Fisher DeBerry, Lieutenant General, Tad Oelstrom, and Orthopedic Surgeon, Dr. Cale Bonds. Jackson is married to Gina, a former track and field athlete at Long Beach State. The couple has two sons, Charlie III and Isaac.